What is it about the Boxer that we love so much? Is it their crazy antics? Their squishy noses? Their abundant kisses? Or the way they wriggle with joy at the sight of their people coming home? It was each one of these attributes that all too quickly stole my heart. They came wrapped in a package of pure white fur with a brindle eye patch and ornaments for ears. It was love at first sight. The world over, white Boxer puppies are being placed in pet homes. Sure, they're not good for showing, but white Boxers have excelled to the highest degree in agility, obedience (you can see evidence of this on the American Boxer club's website http://americanboxerclub.org/winner-2004-HT.html.) and tracking. They are everything a Boxer should be after all, they're the same as any other Boxer - just born white. Some people (breeders as well as potential owners) are worried about the possibility of deafness in white Boxers. Deafness is more prevalent in white Boxers, but only about 20% of white Boxers are deaf. Most of them can hear fine or, like most coloured Boxers, have selective hearing. But as for the 20% that are deaf, I can say from experience that they are normal Boxers that don't have any special requirements, except an owner that is willing to learn a new way of communicating with them. Dogs communicate with each other through body language and don't understand English, so using hand signals and body language as opposed to English to communicate with a deaf dog makes sense. My hearing Boxer Tati responds better to hand signals than verbal commands. Contrary to what some people would have you believe, apart from a higher possibility of deafness, white Boxers are no more prone to disease than coloured Boxers are. Yes, they can get skin cancer if they get sunburnt often (just like flashy Boxers' white bits, and humans too) but putting sunscreen on them each morning can easily prevent this. Our Radar is neither small (he was the biggest in the litter from birth) nor sickly looking from being riddled with disease. At a year old, he's a good 29kg and hasn't had any health issues. I know somebody who lives in the USA that has a white Boxer and a brindle Boxer, and she says that her brindle Boxer has had far more health issues than her 10-year-old white Boxer. Few people are willing to believe that our Radar is deaf. His peripheral vision is extremely good (unless he's trying to ignore you) and he is as obedient (if not more) as any other 1-year old Boxer is. He is extremely perceptive to how people feel (especially the people he's close to), and he can sense if somebody is watching him, even from 8 metres away. If he's in the garden sleeping and I want to call him inside I just need to look at him for a few seconds before he'll look around to see who's watching him and if he sees somebody he'll come running. He does not startle easily and is not prone to biting as a response to being startled (this is probably the biggest and most damaging myth about deaf dogs) and should you wake him up from a deep sleep, his response is a look of "huh?" rather than one of fear. And he's never bitten anyone - ever. He notices things that Tati never has, including shadows and reflections - and he watches TV! He can sniff out a treat within his reach (or just out of) even when it's inside two separate bags and he hasn't seen it. He barks like any other dog and if he sees somebody outside our house that he doesn't like, he'll bark then come call me – even when Tati isn't barking. His training has been easy for the most part. He has completed his puppy class and beginner obedience, and I hope to start tracking with him soon. He knows many hand signals (last time I counted it was nearly 30) and those have been limited only by my sign language skills. Its not important what signs you use with a deaf dog, what's important is that you're consistent with them. We use a few obedience signs, as well as some made-up ones and sign language signs too. Radar's absolute favourite sign is the sign for "treat". When he sees it, he runs up to me so fast he nearly bowls me over because even though he goes into a sit position for his treat, he can't stop his body in time due to the momentum he's built up. Another of his sweet idiosyncrasies is the way that he always needs to be touching me. If he lies at my feet, he has to lie on them. He's the biggest lapdog I've ever seen and he follows me around like a shadow. Now that I've told you about the character of a white (deaf) Boxer, I'm going to tell you a few facts about them. I'll start with facts about deafness first, then about white Boxers. When breeding flashy to flashy, about 20-25% of a litter (statistically) will be white. These white puppies will inherit a flashy gene from both parents therefore they are not albinos. They also usually have skin spots and black noses and/or lips and often have brown eyes which rules albinism out completely. It is estimated that 20% of those white puppies will be deaf. Congenital (i.e. deaf by the age of 5 weeks) deafness is a result of a lack of pigment in the inner ear. 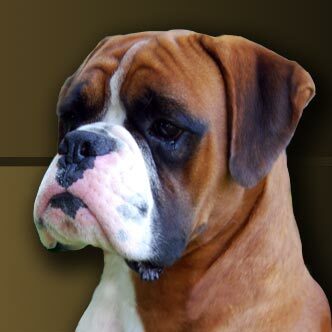 The flashy parts of a Boxer are caused by the extreme white spotting (or piebald) gene. White is not a colour, its a lack of pigment, and a lack of pigment in their coat can be, but is not always, indicative of a lack of pigment in other areas (e.g. their inner ear - resulting in deafness, their eyes - resulting in blue eyes and not blindness). The only person that has done research on deafness physiology is a certain Dr Strain from Louisiana State University. His finding is that congenital deafness in dogs is due to a lack of pigment in the inner ear that suppresses the blood flow and makes the inner ear hairs that are used to sense vibrations fall off. For many years Boxer organisations have unofficially or officially supported the euthanasia of white Boxer puppies, but within the past 10 years many breeders have openly started placing their white puppies in pet homes. This trend has spread through Canada, Australia and Europe. In the USA it grew so big that the American Boxer Club decided to take a vote on a possible change in their code of ethics in January 2005. The outcome of the vote can be seen at http://www.americanboxerclub.org/gaz05-1.html. The vote ended in a 2/3 majority in favour of a change in the code of ethics to allow white Boxer puppies to be sold to pet homes. If there is one thing that I am extremely thankful for, it's for Monique who believes that all puppies born to her kennel have a right to live. I will definitely have more white (preferably deaf) Boxers in my home in the future. To potential owners everywhere, I say please consider giving one of these beautiful white babies a home, even if they are deaf – you will receive far more joy out of them than you will ever put in and every healthy Boxer puppy deserves a chance to live. To breeders I say please consider what I have said in this article. Boxers, be they fawn, brindle or white, hearing or deaf are all the same Boxers that we love so much. There is no health reason why they should be disposed of. For years they've been treated as something to be ashamed of or kept secret, but has that changed the fact that they continue to be born? No, it hasn't. A white puppy of champion health-tested parents has the same genetic make-up as their colour littermates – and if you can be proud of the coloured puppies, you can be proud of the white ones too. Give families the opportunity to have their lives changed by these sweet Boxers that deserve a chance to love and be loved.